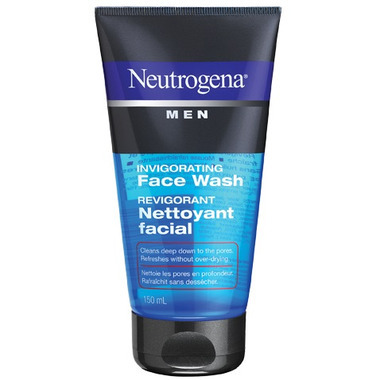 Neutrogena Men Invigorating Face Wash is clinically proven to: clean deep down to the pores, remove excess surface oil and dirt and improve skin's overall healthy look. Cleans deep down to the pores. Remove excess surface oil and dirt. Improve skin’s overall healthy look. Directions: Squeeze a dime-sized amount into wet hands. Rub hands together and add more water to work into lather. Apply to face and massage gently. Rinse thoroughly. Use daily. I purchased this face wash for my (adult) brother. He's not usually the most devoted face-washer, but he loves this stuff and uses it just about daily! He says it feels great. I think his skin has been looking clearer, too. (He gets the occasional pimples and blackheads.) I only wish it was "green and natural."